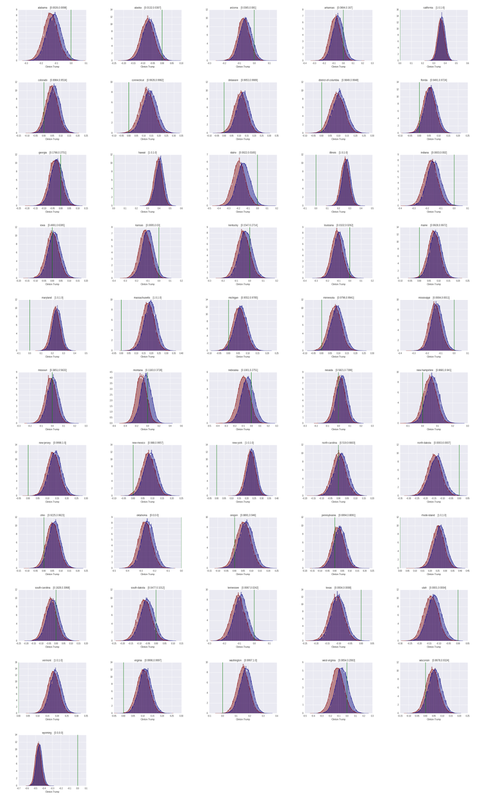 This post is about how to perform a Bayesian analysis of election polls for USA 2016 presidential election. In previous posts, I have discussed how to make a poll for a single State (Nevada as example). Here we will use some simple Python functions to compue the probability for Clinton of winning in all 51 States (State-by-State). I will make use of near-prior ignorance models that were introduced in a past post. States where the lower and upper distributions are across the line. For instance, States that are clearly for Clinton are California, Connecticut, Delaware, etc. while States that are for Trump are Alabama, Alaska, Arizona etc.. The values of the lower and upepr probability of winning the State for Clinton are reported in the top of the plots. One of advantages of near-prior ignorance model is that they allow us to automatically detect the States that are more uncertain, i.e., States where a small change of the vote intention can dramatically change the final result. Let us consider for instance the undecided State 'North-Carolina' (it is undecided because the lower and upper probabilitie are 0.52 and 0.66). It can be observed that a change of the vote of only 2 people from Clinton to Trump (that is 0.4% of the poll sample size) reduces Clinton's probability of winning to 0.52. We are almost ready to compute the general election result, in the next post.